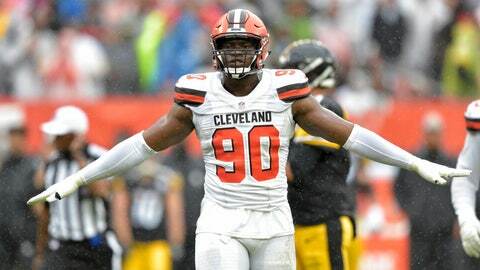 Emmanuel Ogbah did not report for the start of the Browns' offseason program Monday, a sign that a trade was being discussed. CLEVELAND — The Browns‘ draft class of 2016 is rapidly shrinking. On the day they introduced Beckham at a packed news conference, the Browns also re-signed wide receiver Rashard Higgins (restricted free agent), defensive back Juston Burris (free agent), defensive tackle Trevon Coley (exclusive rights free agent) and Jermaine Whitehead (exclusive rights free agent). A fourth-round pick, Kindred had been expected to start after the Browns traded Jabrill Peppers to the Giants as part of the Beckham deal. Needing a safety, Dorsey went out and got Murray, whom he picked in 2016 while he was the Chiefs’ GM. Murray became expendable when the Chiefs signed free agent safety Tyrann Mathieu. The Browns were pleased with Higgins’ development last season and believe he gives them depth at a key position. He had 39 catches for 572 yards and four touchdowns in 2018.